Enjoy the latest edition of The Greater Springfield Times online! With direct links to advertisers and community groups websites and email addresses, you can view and interact from any device, no matter where you are! The publication may take a few moments to load, depending on your browser speed. 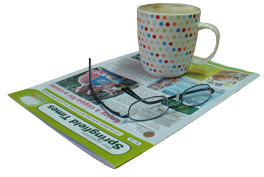 Established in 1997, The Greater Springfield Times has grown as Springfield has grown, with its free monthly distribution reaching the suburbs of Augustine Heights, Bellbird Park, Brookwater, Camira, Springfield and Springfield Lakes. With Orion Shopping Centre fast becoming a local hub for suburbs far and wide, The Greater Springfield Times reaches many more coffee tables than just the homes within its distribution base, with many shoppers picking up their copy when they visit the centre. If you would like to advertise, we have sizes and prices to accommodate all budgets. If you’d like to advertise in The Greater Springfield Times, just let us know. If you’d like to advertise in our sister publication, The Lake News as well as The Greater Springfield Times, discounts may apply. To make an advertising booking, send an email via the Advertise link, or contact us on 07 3201 1880 during office hours.